CARNIVAL OF ILLUSIONS (1946 aka DEVIL AND THE ANGEL) Erich Von Stroheim, Madeleine Sologne, Louis Salou, Yves Vincent, Claudine Dupuis. This is one of the great Von Stroheim films. 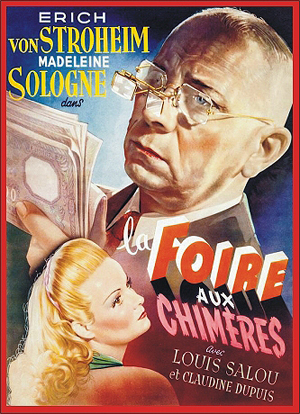 He was billed as the “man you love to hate,” but in this film he gave one of his most sympathetic roles as a prim and proper currency expert at a government mint, whose life spirals into desperation and crime. He is mocked by his co-workers for his hideously scarred face, which keeps him from attaining happiness. Then one day he meets Jeanne, a beautiful blind girl working in a carnival sideshow. She has no aversion to his hideous appearance and they soon are married. Erich showers her with all that money can buy—far more than he can afford. And soon he’s trapped in a counterfeit money scheme, which he hopes will clear his debt. When Jeanne has an operation to restore her sight (unbeknownst to Von Stroheim) their world together begins to crumble. This film is backed by a beautiful music score and excellent performances. A real forgotten classic. Howard Vernon has a small role. English subs. 16mm.